The United States purchased the Alaskan territory from Russia in 1867 for around two million dollars. This price works out to two cents per acre. It was recognized as a territory in 1912 and admitted as the fourth-ninth state in 1959. The state is dominated by the tourism, military, natural gas, and fishing industries. Alaska has 663,268 square miles, and this makes it the largest state in the United States, and it is divided into regions with six large regions being widely accepted. The state is home to more than three million lakes, and it has a combined shoreline of 34,000 miles. Alaska has some larger cities, but it also has many rural areas and small villages. For the most part, people are friendly, but even the larger cities are spaced apart. To live here, you have to be willing to adapt to the local lifestyle, and this includes the climate. However, Alaska is home to some of the most beautiful scenery in the United States, and if you like outdoor activities, Alaska has several year-round things to do. People move to Alaska because they want to try a lifestyle change. The demographics in this state is very diverse, and this diversity shows up all over the state. The scenery and outdoor activities are completely unique to Alaska, and people who want to experience something different move to this state. Additionally, Alaska is home to a few larger cities that are fast growing and have diverse economies. The wide variety of jobs are another big draw for people as well as the no income tax. Alaska is a state that charges no income tax, and it pays its residents once per year a piece of the oil sales that range from $500 to $2000 per person, per household. However, people also move from Alaska for very good reasons. The cost of living in this state is extremely high with an emphasis on housing and groceries. Additionally, the housing costs are also very high, and this may drive people away to more affordable states. Alaska is also more isolated than a lot of the states in the United States, and people may leave to try and find larger cities. The economy revolves heavily around the oil industry, and this is more seasonal work, so people could also leave Alaska in search of steady, year-round work. Younger families find this state attractive, as well as people who are looking to make a lifestyle change. Living in Alaska is a unique experience, and you'd be hard-pressed to find an experience like it anywhere else in the nation. 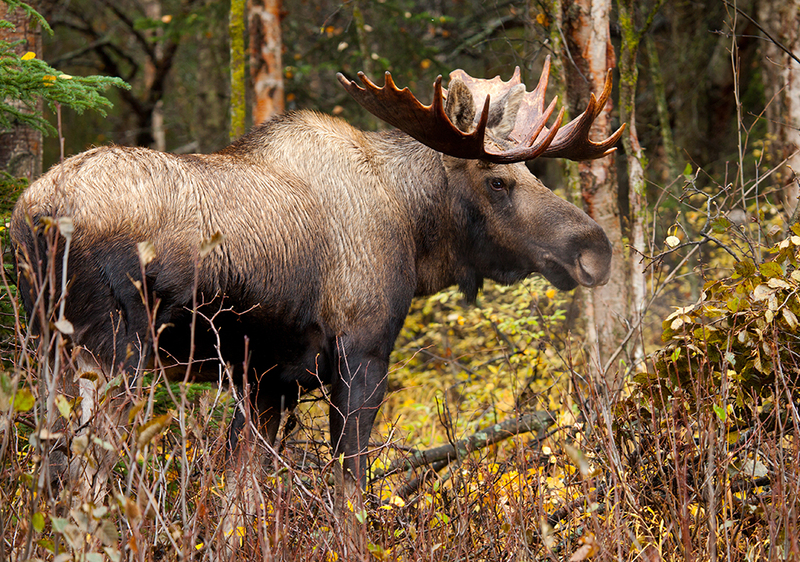 People who love the outdoors and want a large variety of year-round recreational activities are drawn to Alaska as it has world-class hunting and fishing opportunities. Older people may also find Alaska attractive as there are both large cities and smaller communities to settle in and retire. The real estate market in Alaska didn't fall during the housing market crash, instead it plateaued. The third quarter of 2006 was when the real estate market started to show signs that it was in trouble. It went from a steep rise to a more gradual one that lasted until it hit its first and only peak in the second quarter of 2007. Once it hit this small peak, it started on a gradual descent that experienced a small drop during the third quarter of 2008. This rose gradually into another small peak during the first quarter of 2009. When it hit this peak, it started a gradual descent that peaked one more time during the fourth quarter of 2009. This peak dropped to the lowest point of Alaska's housing market in the first quarter of 2010. This low point rose slightly and leveled out into a peak that went largely uninterrupted with the exception of one small peak in the fourth quarter of 2011. This plateau ended in the second quarter of 2012, and the housing market started to climb. The first quarter of 2014 brought a slight dip in the housing market, but it recovered quickly and continued on its climb. The fourth quarter of 2016 brought another slight dip in the housing market, but it recovered quickly. Alaska's housing market has been higher than it was before the housing market crash since the fourth quarter of 2012. Anchorage's housing market showed signs of trouble in the third quarter of 2006 with it went from a rapid climb to a slower pace. The market peaked during the first quarter of 2007, but it didn't go into a fall like the majority of the nation's real estate markets. It did decline slightly, but for the most part, it plateaued. The third quarter of 2008 brought a slight low point that recovered into a slight peak in the fourth quarter of 2008. This peak brought another slight descent that went to another slight peak before the market hit its lowest point during the second quarter of 2010. From this low point, the market went up into another peak quickly, and it dropped off once again during the second quarter of 2011. The second quarter of 2012 saw the housing market's last significant drop which it quickly recovered from. From the second quarter of 2012 to the fourth quarter of 2013, the market went on a steep climb. This leveled off into a slight drop in the first quarter of 2014; then it went into a very gradual climb and slight drop until the third quarter of 2015. This marked the start of a plateau that lasted until the end of 2016, and the market is currently climbing. It has been continuously higher than the point it was at before the housing market crash since the third quarter of 2013. Alaska's housing market started the 1990s with a peak and a drop that leveled out by the third quarter of 1991. The housing market started on a steady climb that saw a slight peak in the third quarter of 1994. This peak quickly leveled off, and the market continued its steady climb largely uninterrupted until the second quarter of 1999. This brought another slight peak, and the market kept steadily climbing until the fourth quarter of 2000. Once this time came, the market started on a more rapid climb that lasted until the third quarter of 2001 when the market peaked and dropped once again. The market went into another peak during the third quarter of 2002, and this peak ended in a slight lag in the real estate market. The market peaked again during the third quarter of 2003 and the third quarter of 2004. Once these peaks came and went, the housing market went into a rapid climb that lasted until it leveled out into a slower climb in the first quarter of 2006. This signaled the start of problems for the housing market. Anchorage's real estate market started the 1990s with a downward slide that hit a low point in the fourth quarter of 1990. This low point rebounded into a gradual climb that went uninterrupted until the third quarter of 1994 when it peaked slightly and dropped away. The market recovered and went into another slight peak in the third quarter of 1995. After these peaks, it leveled off and started to climb at a steady pace with no large peaks or drops until the fourth quarter of 1998, when it hit a brief period where it climbed rapidly. The second quarter of 1999 brought a peak that leveled into a more gradual climb into the start of the 2000s. The 2000s brought a slightly rocky period for Anchorage's real estate market with several gradual peaks that started in the second and third quarters of 2002. The first peak leveled off into a plateau that started to rise gradually into another peak during the fourth quarter of 2003. This peak also leveled off into another gradual rise that peaked once more during the third quarter of 2004. This peak marked the start of a rapid climb for the real estate market, and this climb continued until the first quarter of 2006. This marked the start of problems for the housing market that ended in the final peak before it collapsed. The homeownership rate across the state of Alaska has been quite volatile over the past 33 years, as it has ranged between 55% and 70%. In 1984 ownership stood at 57.6%, jumping to a peak of 61.5% in 1986, then sliding to a low of 55.4% in 1993. Over the next decade ownership boomed, peaking out at 70% in 2003. Ownership then stood around 67% until it began to slide in 2010, bottoming out in 2015 at 62.3%. In 2016 ownership stood at 65.2%. Despite its more rural demographic, Alaska is home to several larger cities and busy metro areas that have a variety of businesses, cultural attractions, and points of interest that draw hundreds of people each year. Anchorage is the most populous city in Alaska with 298,192 people as of 2016. 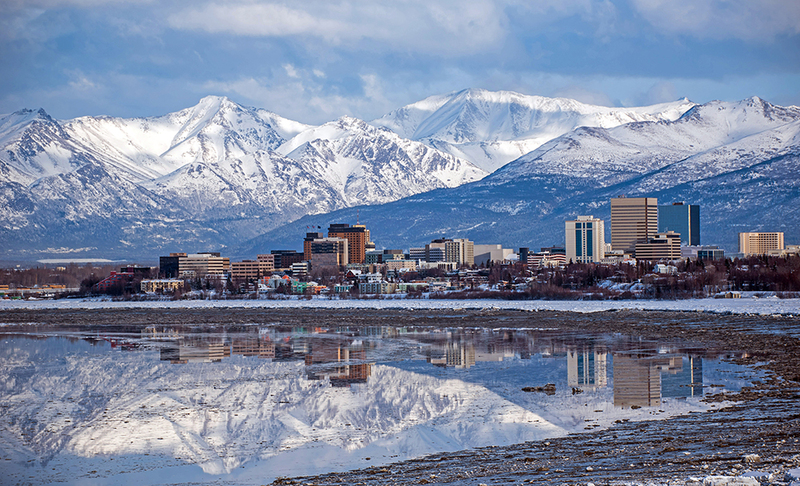 This population makes Anchorage home to over 40% of Alaska's entire population. Anchorage is part of the Anchorage Borough, and the population of these areas is 402,557 people. This works out to more than half of Alaska's total population. This city is known for its diverse economy, job opportunities, and its wildlife that is found in and around the city limits. This city is also a popular tourist destination, and thousands of tourist come through each year. Alaskan tourists often choose Anchorage as the initial stop on their vacation because of the large population and convenient location. 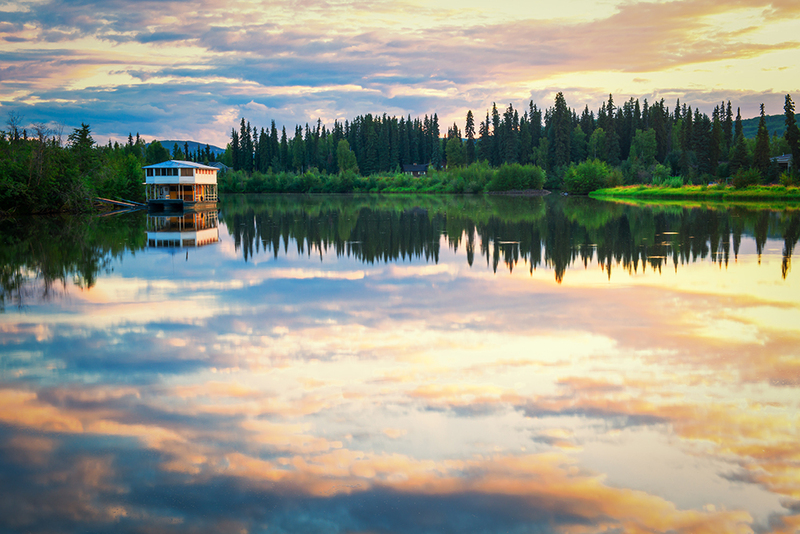 Tourists can head south to the Kenai Peninsula, a popular fishing location, or north to other heavily toured locations such as Fairbanks and Denali National Park. The National Civic League has named Anchorage the All-America City four times, in 1956, 1965, 1984/85, and 2002. 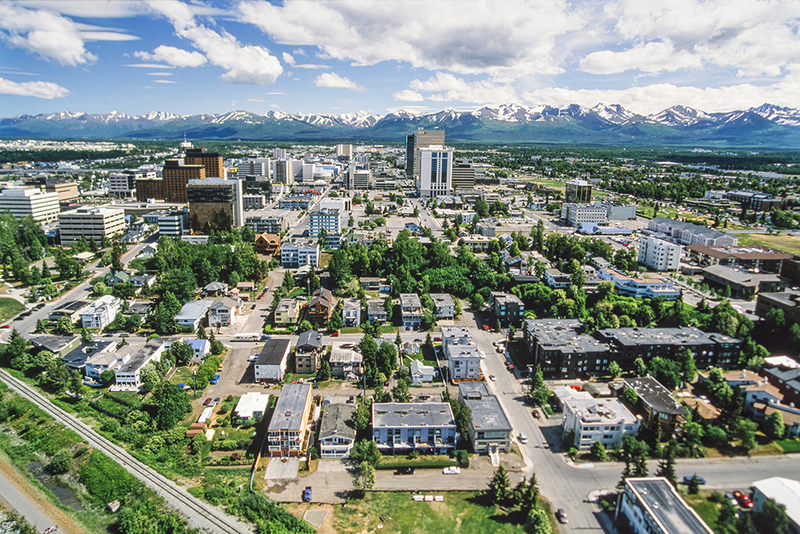 Anchorage has many large economic sectors, and they include transportation, resource extraction, tourism, military, federal and state government, and corporate headquarters. The local airport is the third-busiest airport in the world, and the port in Anchorage passed 95% of all of the goods for the state through it each year. There is also no state taxes in Alaska, but it does charge hotels a 12% bed tax and car rental agencies an 8% tax. There are four small airlines, five regional corporations, two large military bases, and thousands of government employees in Anchorage. This city has a subarctic climate zone that has strong maritime influences which leads to a milder year-round climate. The summer months are usually very mild with rainfall and temperatures ranging from fifty degrees to seventy-five degrees. The winter months bring around seventy-five inches of snowfall and temperatures ranging from five degrees to thirty degrees. The city has a fast growing season of just over one-hundred days. The Alaska Center for the Performing Arts is a three building complex that can accommodate over 3,000 people and it had an average of 245,000 people viewing just over 670 performances per year in the early 2000s. The Anchorage Concert Association is another group that performs around thirty events year-round. The Anchorage Folk Festival takes place each January, and it features over 130 different performances ranging from music to dances to crafts. Finally, the Arctic Valley Ski Area is another popular tourist attraction where you can spend a day. The Anchorage School District serves this city, and it ranks as the eighty-seventh largest public school district in the nation with over 50,000 students and ninety-eight schools. There are four public and private universities in Anchorage that have a variety of bachelor's and master's degree programs. The University of Alaska Anchorage is located here, as well as Alaska Pacific University. Students can also choose to attend Charter College. The economy is very diverse in Anchorage, and it reflects in the city's three biggest employers. The largest employer in the city is the Ted Stevens International Airport, and it has over 3,000 employees. The second biggest employer in the city is Providence Alaska Medical Center & Hospital System with over 1,600 employees. Finally, the employer who rounds out the top three biggest employers is Fort Richardson Army Base with over 1,300 people. Despite this diverse economy, Anchorage has an unemployment rate that is above the national average, and it has only had slight job growth over the past year. This may improve over the next ten years though as Anchorage estimates it's going to add 34% more jobs to its local economy. Anchorage has a local median home price of around $296,300, and this averages out to a price per square foot of $177. These prices have increased over the past year by almost 2%, and they're on point to rise by another 4.8% in the coming year. The Anchorage Borough has a local median home price of $299,900 with an average price per square foot of $166. Fairbanks claims the spot for the second biggest city in the state of Alaska with a 2016 population of 32,751. This population makes this city the largest city in the interior of Alaska. Fairbanks is part of the bigger Fairbanks Borough, and it has a population of 100,605 people in 2016. Fairbanks was founded in 1901 as a trading post, and agriculture was a staple of the city's early economy. The local economy receives a lot of support for the transportation industry, and it is classified as the transportation hub for interior Alaska. There are extensive air, rail, and road connections throughout the city and these industries generate a lot of revenue. Healthcare and education make up two other large economic supports, along with tourism and retail. 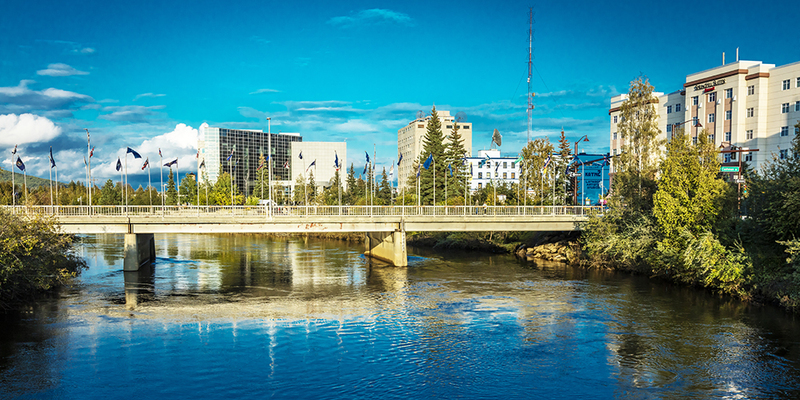 More than 300,000 people tour Fairbanks each summer. Mining is also a significant part of the local economy, with the gold mine of Fort Knox producing 409,844 ounces in 2016, providing jobs to hundreds of people. In December of 2017 Kinross announced they acquired the mineral rights to an adjacent parcel of land known as Gilmore, hoping to further expand their mining operation. The city has a subarctic climate with frigid, long winter months and short, cool, wet summers. The winter months last from the middle of October until the middle of April with heavy snowfall and temperatures below zero. Fairbanks is commonly referred to as America's coldest city because of this. In addition, the summer months have temperatures that typically don't reach above sixty-five degrees. There are wild temperature fluctuations in this city due to its lower altitude, the wind's direction, and its daylight hours. Fairbanks is home to several local attractions and points of interest, and these work to bring people from outside of the city through it year-round. The Open North American Championship Sled Dog Race is a large tourist draw in March, and the World Ice Art Championships also brings people to Fairbanks. It is also a popular stop with many cruises, and people come to experience the local culture and sights. The Georgeson Botanical Garden contains over 150 plant species. The Fairbanks North Star Borough School District serves this city, and it is Alaska's second-largest public school system with 14,000 students. For secondary education, the University of Alaska – Fairbanks has a campus here, or they can choose to attend the University of Alaska Technical and Community College. The biggest employer in the city is government-based, and the Fort Wainwright and Eielson Air Force Base employs over 2,500 people year-round. The second biggest employer is Banner Health System with 1,600 employees. Finally, the employer that ranks as the third biggest in the city is Alyeska Pipeline Service with 1,200 employees. Fairbanks has an economy that currently isn't doing very well. Its unemployment rate is over 1% higher than the national average, and it has lost jobs over the past year. However, this may change in the coming year as it is estimating that it'll add 32% more jobs to its local economy to help strengthen it. The local median home price for Fairbanks is currently $226,100, and this averages out to a price per square foot of $146. Both of these prices have gone up over the past year by 3.9%. In addition to this, these prices are estimated to go up by another 5.2% in the coming year. The Fairbanks Borough has a local median home price of $177,450 with a price per square foot of $159. The third biggest city in Alaska is also the state's capital, and Juneau has a population of 23,468. Juneau is the second largest city in the nation by geographic size, and it has been the capital city of the state of Alaska since 1901. The Juneau Borough has a population of 23,468 people as well. From May through September, Juneau's daily population can increase by more than 6,000 people due to cruises and tourists. Juneau is unique in the fact that there are no roads to or from this city due to the terrain, and everything must come in by air or by boat. 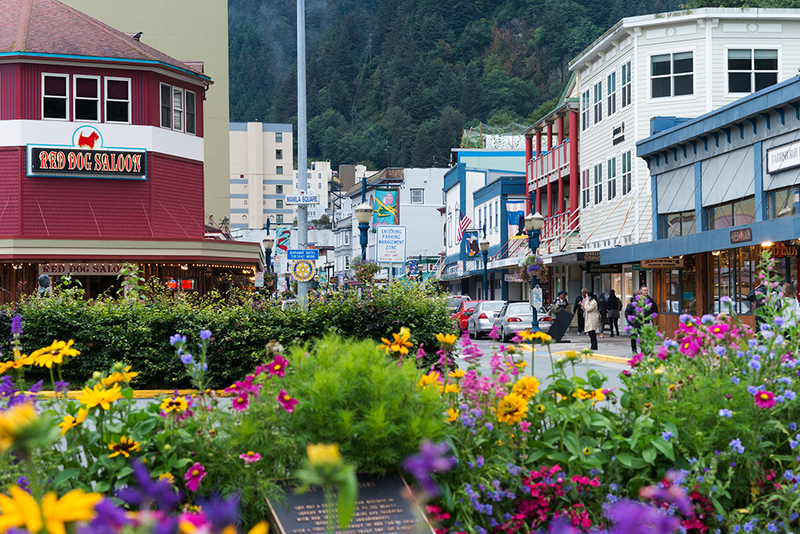 Juneau's economy has very large government influences due to it being Alaska's capital. The primary employer in Juneau is government. This includes the state and federal government, municipal government (harbors, the local hospital and airport, and the school district), and the University of Alaska Southeast. Offices in state government and indirect economic impact of those offices compose roughly one quarter of Juneau's economy. The tourism industry also plays a large role, with as many as one million tourists coming through the city during the summer months. Mining, real estate, construction and commercial fishing also help to provide year-round economic support to this city. An oceanic climate rules this city, and it leads to long but very mild winter months and warmer spring and summer months. January has the coldest temperatures with temperatures usually staying in the twenties, and July's is the warmest month with temperatures in the sixties. Winter runs from November through March with an average of eighty-five inches of snowfall per year, and September through October are the wettest months. Performing arts are very important to this city, and it hosts several events each year. The Perseverance Theatre is found here, and it is the largest professional theater organization in Alaska. The downtown area has dozens of galleries and the first week in December hosts the First Friday Art Walk. The Walter Soboleff Building showcases various carvings and cultural exhibits as well. The Juneau School District has over thirteen public and private schools including a homeschooling program and a charter school. Students can attend the University of Alaska Southeast, which was founded in 1956 and has dozens of graduate and undergraduate programs to choose from. The Hecla Greens Creek Mining Company is the biggest employer in the city, and it has over 1,900 employees. The second biggest employer in Juneau is Fred Meyer Stores with around 1,000 staff members. The company that ranks as the third biggest employer is Southeast Alaska Regional Health Consortium with just over 900 employees. Although Juneau has an unemployment rate that is over 1% lower than the national average, its local economy has lost jobs over the past year. This may change over the next ten years because Juneau is estimating that it will introduce over 34% more jobs to the local economy. Juneau has a local median home price of $338,100, and this averages out to a price per square foot of around $220. Over the last year, these prices have gone up by 5.2%, and they're estimated to go up by another 3.2% in the coming year. The Juneau Borough has a local median home price of $352,500. According to the United States census an estimated 741,894 people live in the state of Alaska. The state has 663,268 mi² of area, which gave it a population density of 1.12 per mi². Here is a list of cities & municipalities with more than 500 residents, with their estimated population as of June 2016 & the 2010 United States Census. As of 2019 Alaska has a conforming loan limit of $726,525 for single unit homes. The limit is as follows for 2, 3 and 4-unit homes: $930,300, $1,124,475, and $1,397,400. Home buyers who are borrowing more than the above amounts to purchase premium properties will likely need to obtain a jumbo mortgage. Jumbo loans typically have a slightly higher rate of interest than conforming mortgages, though spreads vary based on credit market conditions. Several different types of home loans are available in The Last Frontier State. Fixed-rate loans are very common, and the terms include thirty, twenty, fifteen, and ten years. The longer the life of the mortgage, the lower the monthly payment will be, which is why the 30-year loan is the most popular. The downside of this, however, is that the APR is higher compared to shorter-term loans. The difference can be as large as a full percentage point. Alaska has several home loan programs designed for both first-time home buyers and people looking to purchase a second home. These programs may also help low-income households afford a mortgage and help pay closing costs. The Closing Cost Assistance Program will only work if an applicant first gets one of the many Alaska Housing Finance Corporation's low-interest, 30-year fixed-rate mortgages. The total funding will equal 3% or 4% of the mortgage's total cost, and this depends on the applicant's credit score. So, if someone has a home loan for $300,000 and they get assistance up to 4%, they'll get $12,000 in additional funding. This funding can be used to pay the down payment or closing costs. Applicants do have to have a minimum credit score of 640 to qualify for this funding. However, there are no first-time home buyer, income limits, or purchase price limits with this program. You do have to use a lender that is currently participating in the program to receive the funding. AHFC also has programs serving veterans, low-income borrowers and rural residents across the state. Those buying energy-efficient homes or upgrading existing homes can also enjoy intreest rate reductions. Standard homeowner's insurance policies typically cover damages from most natural disasters other than earthquakes & flooding damage. Homeowners can buy earthquake & flood insurance policies to augment their basic homeowner's insurance policies. Hail & tornadoes are quite uncommon, but many other hazards exist across the state. Cyclones: In November of 2011 & 2014 a Bearing Sea cyclones hit Alaska. The 2011 storm was believed to wash a person out to sea, while the 2014 storm struck the Aleuthian Islands with gale-force winds. Hurricanes & Typhoons: Since 1978 a typhoon and four former hurricanes (which were lower strenght storms when they struck Alaska)have hit the state. Most of the state has a very low risk of hurricane storm surge, however Kenai Peninsula has a moderate risk & Juneau has a high risk. Wildfires: The lush forests running across the state are afertile grounds for wildfires. In 2004 over 6,6 million acres were burned across the state from 701 fires. While these fires burn a lot of land, the statewide wildfire risk is considered low to homeowners since most people live along the coastal areas distanced from the lush forests. Snowstorms: Fierce snowstorms can drop a foot or more of snow in a single day across key parts of the state including Anchorage. Earthquakes: Since 1906 Alaska has had about a dozen major earthquakes with a magnitude above 7.0. Over half of these earthquakes have also caused tsunamis or megasunamies. Earthquakes happen quite regularly across the Aleutian islands and strong earthquakes have hit as far inland as Denali National Park. Other than the Northern Slope, Dillingham county along with Wrangell Citty and Borough most of the state has a moderate to very high risk earthquake risk. You can learn more about earthquake risk across the state here. Tsunamis: The southern coast of the state running out from the easternmost point on through the Aleutian Islands has a significant tsunami risk. Volcanoes: A chain of volcanoes is what helped create the thousands of islands extending from the Southwest of the state. Volcanic activity can be tracked at the Alaska Volcano Observatory. Landslides: Other natural disasters also often lead to landslides. Flooding: there have been many significant floods across the state. Some of these are the result of other natural disasters, while snowmelt, dam breaks & levee failurs also pose significant risk. The	flooding risk across much of the state is considered to be very low. However the risk in Nome is very high, while the risk is considered moderate in the following areas: Matanuska-Susitna, Kenai Peninsula & Juneau. You can find more information about the above risks on the US Geological Survey website. Alaska currently has one of the highest property tax costs in the nation, due in large part to above-average median property prices, which are driven in part by the need for higher quality construction to deal with the cold winters & higher local conforming mortgage limits. In 2016 the median national assessment was 1.24% while the average assessment rate in Alaska was 0.96%. On a property with an assessed market value of $232,900, a property owner can expect to pay around $2,422 in property taxes each year. This price averages out to 2.95% of the property owner's annual income. The Anchorage Municipality collects the highest property taxes, and they collect $3,563 per year. The Hoonah-Angoon Census Area collects the lowest property taxes each year at $678. Single-family homes were valued at $336,088 in 2016, which led to a median assessment of $3,225. Alaska allows for property owners to claim a homestead exemption in the event that they suffer an unexpected loss of income due to disability, unemployment, an hour decrease, or a medical emergency. Alaska allows for a property owner to claim up to $54,000 as their homestead exemption, and this means that a creditor may not take this portion of a property to satisfy any debts the homeowner may have incurred due to loss of income or a medical emergency. The state of Alaska allows for both judicial and nonjudicial foreclosures. Most mortgage lenders choose to go through the nonjudicial foreclosure process, which requires the mortgage lender follow a detailed set of guidelines. It is important to note that Alaska is a recourse state with restrictions. If the mortgage lender chooses to go through the nonjudicial foreclosure process, they're not allowed to sue the defaulted borrower for a deficiency. If the mortgage lender goes through the judicial foreclosure process, they're allowed to sue the defaulted borrower for any deficiency up to the full amount. If the property sells at a short sale, the defaulted borrower can negotiate with the mortgage lender to forgive all or part of any deficiencies that may occur due to the short sale. If the mortgage lender agrees to forgive most of the deficiency, the amount that is left may be able to be claimed as taxable income. A deficiency usually occurs when the property is sold in a foreclosure auction or a short sale but the winning price doesn't cover the full amount the defaulted property owner owes the bank. If a home is worth $300,000 and it sells at a foreclosure auction or at a short sale for $240,000, there is a deficiency of $60,000. This amount is what the mortgage lender can then sue the defaulted property owner for, and they can recover this money by putting an lien on any other properties the person may own, garnishing their wages, and levying their bank accounts. Alaskan lenders are allowed to foreclose on mortgages and deeds of trust in default using a non-judicial or judicial foreclosure process. The length of the process varies depending on the method used, but it's typically 3 months. In this type of foreclosure, the lender files a lawsuit to acquire a court order to foreclose. After the court declares a foreclosure, the home will be auctioned to the highest bidder. This method of foreclosure has become more popular since the late 1980s, when lenders discovered that they frequently foreclosed on property worth much less than the amount owed. This type of foreclosure is used when a “power of sale” clause exists in the deed of trust or mortgage. A “power of sale” clause means the borrow pre-authorized the property sale to pay off the loan balance if they default. This gives the lender or their representative, sometimes referred to as a trustee, the power to sell the property. The representative/trustee must record a notice of default in the recording district no less than 30 days after the default and no less than 3 months before the sale. The notice of default must state the borrower’s name, describe the property, the borrower’s default, total amount the borrower owes, the book and page the deed is recorded, and the representative/trustee's wish to sell. Additionally, it must state the place, time and date of the sale. Within 10 days, the representative/trustee must mail a copy of the very same notice of default by certified mail to the last known address of the borrower, in addition to anyone whose claim or lien on the property in question appears on the record or is known to either the trustee or any occupant. It is acceptable for the trustee to have the notice of default delivered personally. The borrower can immediately stop the sale at any time by paying the sum equal to the missed payments plus attorney's fees. The lender cannot require the borrower to pay off the entire loan, only the attorney's fees and missed payments. If the lender has recorded a notice of default twice before, the lender is free to refuse the borrower's money and proceed with the sale. The sale of the property must be a public auction held at the front door of the courthouse of the superior court in the judicial district the property is located. The representative/trustee must sell to the highest and best bidder. The lender is free to bid at the auction. The representative/trustee can postpone the sale of any portion of the property by writing a signed request to the conductor of the sale, complete with a stated date and hour. It must be publicly announced that the sale has been postponed, and take place at the original location. Check out the following resources to learn more about the Alaska real estate market.